Our clinicians specialize in highly personal physical therapy care. As an outpatient physical therapy clinic, our licensed P.T's specialize in the treatment of orthopedic, neurological, work and sports related injuries, balance problems, and pre/post-surgical conditions. We offer unique gym memberships for post therapy, fitness training, and weight control management. We don't just heal injuries. The staff at Ledsema are accomplished triathletes and marathon runners. We combine our experience and state of the art technology to identify biomechanical problems and bad habits. We then develop custom athletic training programs to maximize athelete performance and minimize injury. 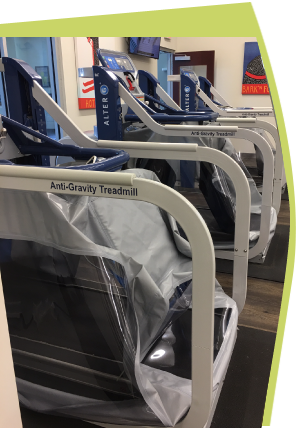 Our facility includes state of the art equipment and the trained staff to maximize your recovery and/or physical training: 1) Area's first anti-gravity Alter-G Treadmill, 2) Biodex Isokinetic Machine, 3) Biodex Balance S/D System, 4) Dartfish Motion Analysis Program, 5) VO2 and RMR (Metabolic)Testing, 6) Full circuit Cybex Weight Equipment.